This was one of my least favourite looks of the challenge. Not because it wasn't made of cute pieces or a cute idea, but because I didn't feel it was flattering so the whole day I felt a bit self-conscious. 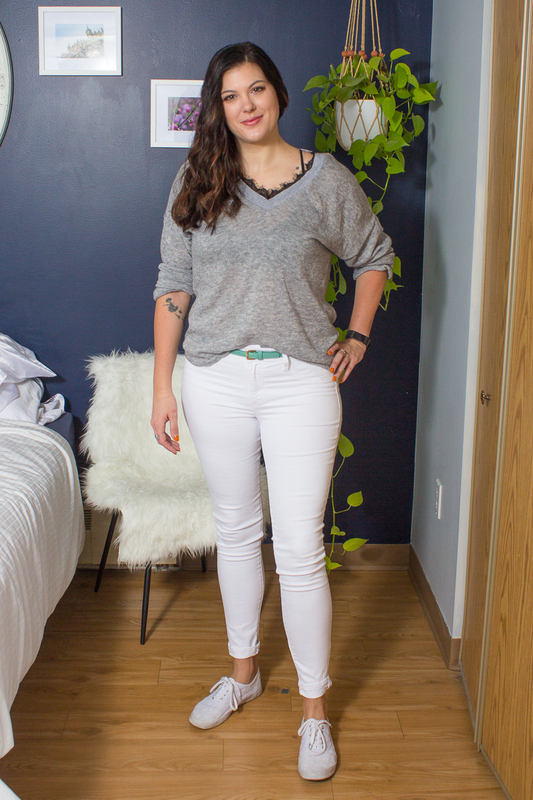 White pants have been a bit tough for me mentally (which is why I wanted to include them in the fall style challenge to begin with) but I think here it was the all light combo that didn't quite work. I like black. Or navy. Or something a little sturdy in the way of colour or material. You can see I was really playing with how to layer here - and also, I find blazers with only a cami underneath a bit uncomfortable (sticky), so I wanted the long sleeves without being basic. I STILL don't know how I feel about this. I so rarely do an open button-up with something underneath. But maybe I should? I don't know guys. I still don't know. This outfit was pure fun and an intentional homage to 90s fashion. I was watching earlier episodes of the Gilmore Girls when it wasn't uncommon for Rory to do this with like a white tee and a baby blue tank - so while my effort is decidedly more grownup, it's still definitely not trendy hahaha. I liked it though! I forget to keep playing with fashion sometimes and not take myself too seriously. This is an outfit I'll definitely be wearing again. I loved it! It was a desperate last minute attempt to pull something together and I only got to wear it for about an hour, but I immediately wanted to re-wear it (and in fact re-worked the same look later for the ballet by upgrading to a fancier sweater). I NEVER do the full buttoned-up look but I think I've been really missing out. The key for me might be a bouncy ponytail to draw the eye up - I am a little wider set and I think that's why I've steered away from this look before. It's all about a little trickier! The vee of the sweater over top helped me achieve a similar feel to an open neckline, too, I think. 1. Mahogany is the new black. No really. 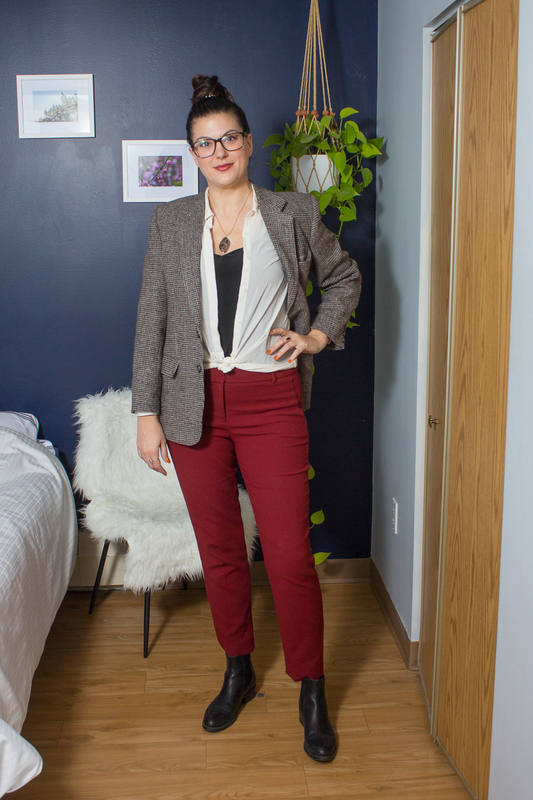 I immediately went out and got my nails done in mahogany and it's taken everything I have not to buy the matching mahogany blazer to these pants. Mahogany is life. Oh, and you may have noticed the blog got some colour updates - including, you guessed it, mahogany! 2. I prefer unfussy looks. I love when you see stylish people in their many layers and bold colours, but generally speaking I feel most like me when I'm in a simple palette and unfussy clothing that takes me from each part of life with ease. 3. I own way too many things and don't necessarily want to wear the majority of them on the regular. So I'm thinking I may need to seriously re-evaluate and hone in on my personal style, and ditch a few of those brightly coloured or busy pieces that just don't make me feel like the version of me I am most comfortable as. You know? 4. If I am going to invest in more items, I think simple coloured and easy-to-layer staples should always be my priority. So this challenge actually did help me cut down on shopping because I'm feeling way less inclined to shop impulsively or for pieces that wouldn't offer me that simple aesthetic and longevity. Did you guys take anything away from watching me do this? Did you attempt anything new? I'd love to know about it in the comments if you did!